Journal of Immunodiagnostics is an open access peer-reviewed broad scope journal publishes original articles, reviews, commentaries, short communications, case reports, editorials, letter to editor and Perspective articles. 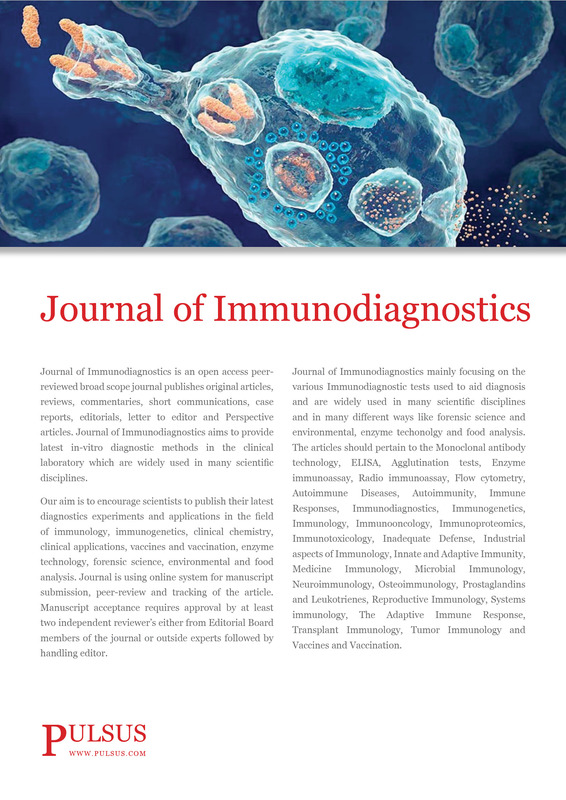 Journal of Immunodiagnostics aims to provide latest in-vitro diagnostic methods in the clinical laboratory which are widely used in many scientific disciplines. Our aim is to encourage scientists to publish their latest diagnostics experiments and applications in the field of immunology, Immunogenetics, clinical chemistry, clinical applications, Vaccines and Vaccination, enzyme technology, forensic science, environmental and food analysis. Journal is using online system for manuscript submission, peer-review and tracking of the article. Manuscript acceptance requires approval by at least two independent reviewer’s either from Editorial Board members of the journal or outside experts followed by handling editor.